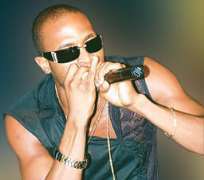 Gist has it that the relationship between Telecommunications giant, Globacom and one of its ambassador Dapo Oyebanjo a.k.a D'Banj has gone sour on the account that the young entertainer asked for an increase in his pay per show. D'Banj we gather earned N2million per show and was the highest paid ambassador who allegedly got N70million, and was also given a brand new Landcruiser jeep recently. His alleged excuses was that he spends N500,000 on transportation whenever he has to perform, adding than he would be left with nothing less than N500,000 at the end of the day which is why he asked the company to increase his fee to N4million per show. Gist has it that, the company was disappointed when it got the letter from its prized ambassador and this got the chairman of the company, Dr. Mike Adenuga, Jnr. very angry. With the preferential treatment being meted out to him (D'Banj), they did not expect him to be requesting for more and not even through his lawyer. Well, his action led to a reaction from the company's boss who gave an express order that he be stopped from performing at Ibadan even when he came to the venue with his crew. Gist has it that the company already contacted P-Square as replacement for N3million due to the urgency. Although, D'Ban's manager Sunday Are confirmed that the artiste did not perform at Ibadan but he gave a different reason, saying that the artiste had earlier informed the company that he had been invited to perform at Barack Obama's inauguration and will need the company's permission to attend the event but had no choice than to proceed to Ibadan. On getting there, he realized that the company had replaced him with P-Square. Speaking on the issue of increment, Are said he is their ambassador and is entitled to make his demand since this is a season for artistes to make their money. It is between him and the company to sort out. Meanwhile, P-Square will be headlining the Rock & Rule concert alongside other artistes until the issue is properly resolved.